The Senate scandal escalated within a year to reveal real cracks in the way the Upper Chamber works. A red chamber filled with individuals appointed for political reasons revealed just how much control a single entity could have on it. The senate scandal may now be a full-blown PMO scandal, severely mishandled from the start, but it reveals how an arbitrary majority of "Conservative" senators could take control of the chamber of sombre second thought and reduce it to the robotic and systematic chamber of minions whose sole role is to advance the PMO's policy agenda. We need not look further than the Senate's Internal Economy Committee to watch the Conservative hierarchy try to protect their own before inevitably throwing them under the bus. The whitewashed Deloitte audit goes to show how deception and political control have plagued an essential institution and turned it into the second House of Commons. 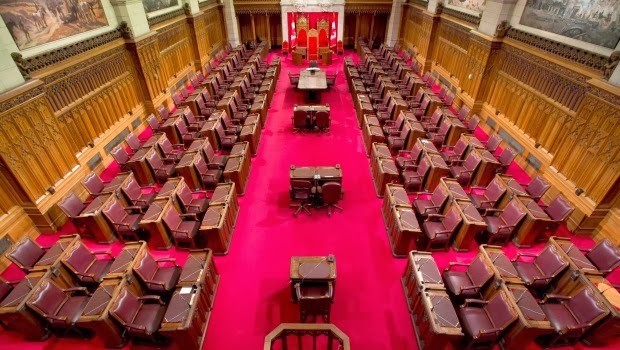 The Conservatives campaigned for senate reform and despite being in power for 8 years up to now, all they've truly accomplished is to wait for the Supreme Court of Canada to explain how the government should proceed with reforms, given any structural changes would require the messy and unforgiving reopening of Canada's constitution. Their goal to create an elected chamber managed by the provinces would achieve only one thing: literally create a second house of commons. Canadians need not look further than their neighbours to the south to see how two parties, polarized with conflicting views, can create chaos and gridlock when the two chambers are not occupied by the same ruling party. The Conservatives know all too well, despite Harper's opposition to appointed senators, he managed to appoint 59 of them to assure a Conservative majority in the senate - one that would act as a voting block like his whipped caucus in the lower chamber. The fundamental flaw with an elected senate is it will inherently be partisan. Any individual or group of individuals whom have any hope to maintain a seat and salary in the senate will have to campaign on something and thus their record won't be neutral. 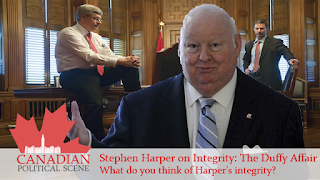 Creating a second house of commons would be a colossal waste of taxpayers' money that can easily be reallocated to the researchers that were recently fired by the Harper government. The New Democrats in turn have started their "roll up the carpet" campaign that would abolish the senate altogether. It is a solution that is popular among Conservatives as an alternative to an elected senate, but it too has its flaws. The campaign will be an easy sell and until this week, the NDP have been perceived as the leaders on the senate file. However, it would cancel the safeguard that reviews and rejects policies deemed to have been badly thought out and jammed through the Commons. Both solutions will likely require reopening the constitution and there is nothing Quebec Sovereignty Premier Pauline Marois would love more. The provinces would have a field day: being brought to the negotiating table to discuss the Senate only to set their own agendas and hold our nation's unity hostage. However, NDP Leader Thomas Mulcair appears to have neglected this fact when he criticized Trudeau's statement on Canada AM yesterday. “It’s not that hard to change the Constitution when you find out that an institution no longer serves the same purpose as when it was created,” Mulcair told Canada AM. Until this week, the Liberals were seen as the party of the status-quo. There is no doubt a commons that wasn't dominated by a single political party would have thoroughly analysed and changed recent ominous bills but in the political game, power trumps good politics and good governance. Trudeau's bombshell announcement has left many confused, even the very senators who are fighting the decision and staying true to their affiliation. However, this move was not only bold and strategic, it is one that goes back to the root purpose of the senate: sombre second thought. Given the circumstances that have together lead to the mess of a senate today, it is clear that changes are needed. However, change won't be easy. Both the Conservative and NDP plans are either non-existent or unrealistic. They both can pin their misfortunes on the file on the Liberal Party - as doing so would favour both their electoral odds - but that doesn't mean they're doing the right thing. The Conservatives were in power for 8 years and have yet to do anything to resolve the problems other than send Pierre Poilievre as a spokesman to claim Trudeau's popular move was a mere "smokescreen." If the Conservatives would have dismantled their senate caucus, they would have been applauded as well but given a party that is descending into chaos, control is the most important element to their political survival. Their loss of control is notable by the 8 MPs who recently broke ranks to pass an NDP bill on electronic petitions. The Liberals are the third party in the House of Commons and given Trudeau's solid support and the party's continued lead in the polls, they are in the best position to capitalize on the senate - and have. The Conservatives have a majority in the senate and no Liberal front will break it. Trudeau had nothing to lose dismantling his senate caucus, but instead stands to have a lot to gain. 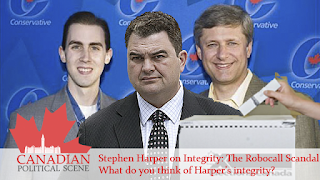 As cracks continue to form in the Conservative caucus, it is likely the Reform and Progressive segments of the Conservative Party will continue to grow apart and with centrist Liberal policy, Progressive Conservatives in the Conservative coalition are looking to the Liberals to restore their voice in Canadian democracy. The freedom in being an independent Senator will likely entice the Conservatives across the room whom are becoming evermore fed up with the job of taking orders and losing their right to think in order to advance the "Conservative" mission - even if some of its parts are fundamentally flawed and even defy Conservative logic. Trudeau's accompanying announcement laid out a firm reasoning to his bold move. Returning to the senate's root purpose, the era of patronage and partisanship were clouding the red chamber's ability to function. Individuals taking orders from party hierarchy and being appointed for their contributions to the governing party is no way to provide neutral reflection of legislation passed in the House of Commons. Free and independent senators can be as Liberal or Conservative as they want to be, but no matter this affiliation nor this philosophy, public policy is destined to succeed or fail in practice on the basis of evidence and empirical data and research. Individuals can be Liberals and disagree with policies they put forth as can Conservatives in this regard. In a partisan senate structured to whip votes by party affiliation, there is no room to spot mistakes and the country's public policies suffer as a result, potentially inflicting individuals, businesses, interest groups and the overall economy and rule of law. “So what I’ve done is remove any sort of link or control by the Liberal Party of Canada over those formerly Liberal senators. And what that means is that the only people who get to sit in the Liberal Party caucus are people who were elected by the people of Canada,” he said. Trudeau's move is a first step and shows how the leader of the third party can do something about a massive problem without being Prime Minister. Trudeau also avoided constitutional reform and all the headaches that accompany it - however it would appear he needs to update the Liberal Party's constitution. In its root, the senate is the chamber of sombre second thought and being anything else would just be a wasteful use of taxpayer's money. Trudeau's move is bold and strategic and has put the Liberals in the driver's seat of this issue. He had nothing to lose abandoning those senators, but if Conservative divisions continue to grow and Canadians support the classical purpose of a senate, he may have all to gain. Nonetheless, the next economy will be fought on the economy and a rerun of 2011 NDP-like policies may act to hinder the solid centrist base Trudeau has built in such a short time, taking the moderates away from his chief rivals the Conservatives and NDP who would rather anyone have these votes than the Liberals. What do you think of Trudeau's bold move? Share this article and join the discussion and let us know what you think: Facebook, Twitter, Google+.